I’ve waved the white flag and retreated to the kitchen table this morning. It was the unexpected nature of the rush and stress that did me in and led to my defeat. I woke up without major plans or a busy schedule, determined to soak in the joy of winter break for just a few more days. And by ‘it,’ I don’t mean one crisis. Not an accident or disaster or tragedy. No, more like life trampling all over my garden of peace and tranquility. Like four children all needing help at the same time, calling out “mom” (or the newborn equivalent thereof) in harmony from all four corners of the house. Suddenly I was off on missions of finding and fixing and feeding and changing and breaking up fights. And that, my friends, is when momma gets grumpy. My vision of winter break rest turned into sorting through the cabinets and cleaning out drawers and discovering where children had hidden the missing top to my water bottle (behind the television cabinet) and the missing Xbox game (in the very back of the DVD cabinet) and various other long-lost treasures. All before mom had her cup of tea and time with Jesus. Life can suffocate us at times, slam right into our sides and knock the very life-breath out of our bodies when we’re not looking. Pretty soon we’re panting on the sidelines, injured, weary, and defeated. Yet, Psalm 62 says that God is “solid rock under my feet, breathing room for my soul” (Psalm 61:1-2, MSG). In a few days, I’ll be back to zooming around town in the minivan, picking up children, dropping off children, passing sandwiches to the kids in the back because we won’t make it home for dinner and coaching them on homework all from the driver seat as we bounce from school to ballet to church to play practice and back again. And right there, in the middle of the ‘mess, noise, and busyness’ of life is where I need God to manifest His presence and to breathe life back into my hyperventilating soul. 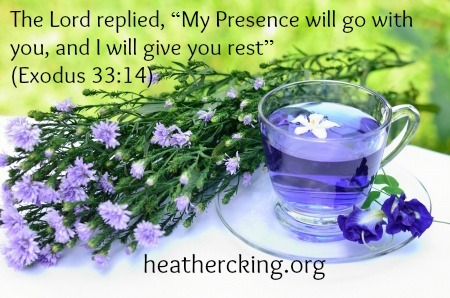 The Lord replied, “My Presence will go with you, and I will give you rest” (Exodus 33:14). A promise like that might leave me in a blubbery mess of tearful gratitude and peace—His presence and the promise of rest. Yes, Lord, Amen!! The promise of God’s presence and rest didn’t come at the end of the journey or on the edge of Canaan either. It was right there at a mountain in the middle of the wilderness. So, Moses got a little bold. Or a lot bold. “Now show me your glory” (Exodus 13:18). Here I sit at the beginning of a new year praying the same thing. Please, Lord, show me Your glory on the mountain, in the wilderness, along the journey, in the everyday travels. Let me know the heavy weight of Your presence as I go. This year I’m choosing one word to focus my faith-journey and I’m making it a year-long pursuit. I’ll be writing each month about how I’m pursuing God’s PRESENCE in a particular way. Will you share with me in this pursuit of the PRESENCE of Christ? I’d love for you to comment, write your own blog posts and share them with me, email me and give me tips, ideas, failures and success stories as we pursue His PRESENCE. I would love to join you on this journey . It’s just the type of trip I need to take! Thanks for inviting me. I love your monthly list. Something to look forward to each month. I so need to feel the Lord’s presence. Yay..I’m not too late! I would love to join you on this journey in the PRESENCE of Jesus! Thank you so much for all you do…truly a Blessing! Definitely not too late, Cindy! I’m so excited that you’ll be joining on this journey! I’ll be writing about a different theme each month and I’d love to hear your comments along the way. What’s working for you? What are you discovering or learning? What’s been difficult? That kind of thing! I’m so thankful that God uses us to encourage, teach, and bless one another!! you writing this article plus the rest of the website is also very good.